AURORA — A failure at the Cherry Creek Dam would inundate the heart of the Denver area with a torrent of deadly water, putting more than 280,000 people, nearly 39,000 structures, and $14 billion of land and property in jeopardy. That nightmare scenario is why federal officials are taking steps to assess the safety of the 140-foot-high earthen dam on the border of Denver and Aurora and lay out ways — such as raising the dam, building a second spillway or adding more relief wells — to make it safer. On Saturday, the Army Corps of Engineers will take its Dam Safety Modification Study for Cherry Creek Dam to the public to get feedback on how to move forward. Another meeting was held Thursday night. John Palensky, the Army Corps’ Cherry Creek Dam safety-study manager, said any risk associated with the 65-year-old dam is because it is perched over a densely packed urban corridor, not because of problems with its structural integrity. That said, Cherry Creek Dam has received an elevated risk rating from the Corps because of its large downstream population. The agency began screening its dams — it has about 700 across the country — after Hurricane Katrina in 2005 to determine each structure’s risk level. The Corps also runs the Bear Creek and Chatfield dams in the metro area. The Chatfield Dam was completed in 1975 after floods 10 years earlier caused millions of dollars damage to Denver and the South Platte River basin. The Cherry Creek Dam also was built as a flood-control structure. It has never come close to overtopping since its opening in 1950, according to the Corps. Its spillway, which would divert rising water from Cherry Creek Reservoir long before the top of the dam was reached, has never been used. The highest water level recorded in the reservoir was 5,567 feet in 1973 — just 15 feet above its normal level, said Army Corps dam-safety engineer Steve Butler. The top of the dam is at an elevation of 5,646 feet. The Corps has projected that it would take about twice as much precipitation as was dumped on Boulder County during the historic floods of September 2013 to cause water to spill over the top of Cherry Creek Dam. The chances of an overtopping are one in 58,800 in any given year, the agency projects. But Butler said a storm of that size, while “very unlikely,” is not outside the realm of possibility. And the consequences of such an event would be so severe that they can’t be ignored, he said. 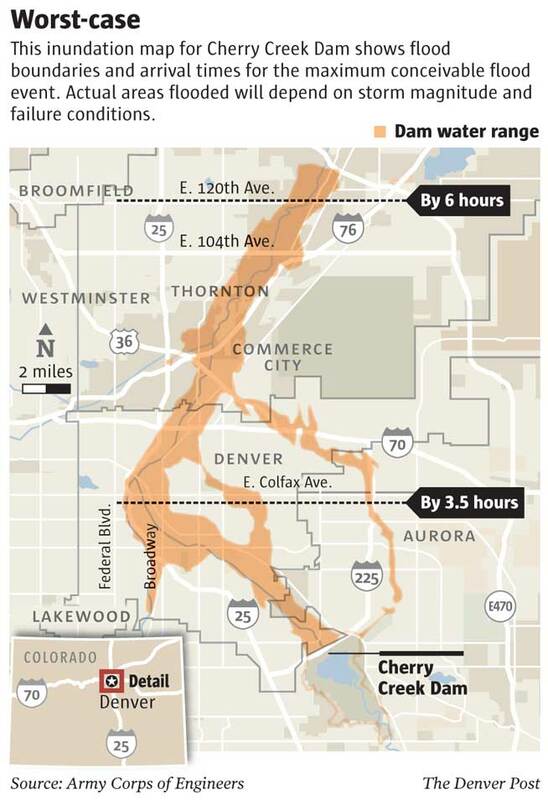 An overtopping of the dam would send 143,900 cubic feet of water per second crashing over Interstate 225, through Kennedy Golf Course and along 11 miles of Cherry Creek to the confluence of the South Platte River in downtown Denver — wrecking houses, sweeping cars off roads and potentially flattening entire neighborhoods. A breach would send that much more water downstream. And the damage wouldn’t be limited to the metro area. The inundation area would stretch all the way into Nebraska, according to Corps modeling. Scott Field, head of the Denver Office of Emergency Management and Homeland Security, said a failure of the Cherry Creek Dam is such a distant possibility that it doesn’t keep him up at night. His office has been looking at ways to evacuate people as quickly as possible along Cherry Creek should it become necessary. He hasn’t taken a position on whether any particular measures or safeguards, such as raising the dam or modifying the spillway, should be implemented. Part of the reason is that the Corps hasn’t attached costs to any measures. “We’re still at the ‘everything is on the table’ point in this discussion,” Field said. This entry was posted in Hentzell Park Update and tagged Cherry Creek Dam, Denver Post. Bookmark the permalink.